Artists' books are related to printmaking, in that works may be editioned in a limited number of copies, all handmade in the same manner. Unlike normal books, however, they are as much about form as they are about content. They can be thought of as a cross between an ordinary book and a piece of scultpure or mixed media art. They often do not look like regular books, sometimes they have no pages or no text, sometimes they have minimal or incomplete text. But like most books, artists' book are usually intended to convey a message or story or idea. And unlike artwork that is hung on a wall or displayed in a case, artists' books are usually meant to be handled, pages may be turned, the "book" may be opened or viewed in different ways. Most of my current artist's books are about human challenges to the survival of life in the oceans, including climate change, global warming, ocean acidification, overfishing, oil spills and other pollution. The books are all handmade, and are either unique works or are made in very small limited editions. They combine various traditional and contemporary techniques, such as hand printed linocuts and digital images. 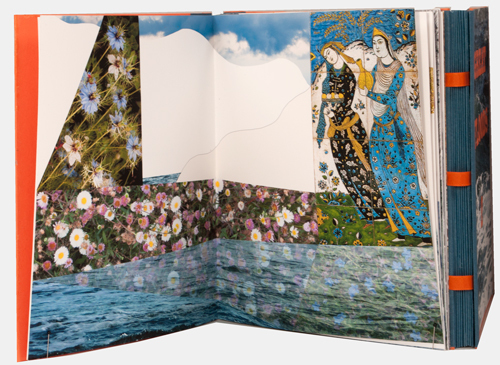 PUBLIC COLLECTIONS that include Barbara Milman's artist's books. Books can be purchased from RED PARROT PRESS.